The relationship between citizen and state in Scotland is changing. The Commission on the Future Delivery of Public Services (Christie Report), 2011, states that Scotland needs to reform the way in which public services were delivered in the face of increasing demographic, economic and political pressures. Christie recommended that increased collaboration across public services and engagement with communities would help organisations deliver improved services at reduced costs, in an open and transparent environment. More recently, the First Minister has set out a clear ambition that we reform public services and empower communities, recognising the need to make government ‘more open and accessible to Scotland’s people than ever before’. We are at a crucial point in the transformation of Scotland’s public services, and must ensure that we are ‘fit for the challenges of tomorrow as well as today’. Cultures, silos and hierarchies need to be challenged and changed. Only a truly collaborative, participative and co-productive approach will enable public services to flourish, and respond to the needs of the people of Scotland. The Ingage team has been formed to support us all to meet these aims. The team is working across Scotland, with communities, public services and those in power, to enable, support and grow our capability and capacity to transform together. We bring together colleagues with a range of experiences in working with and in different public services. 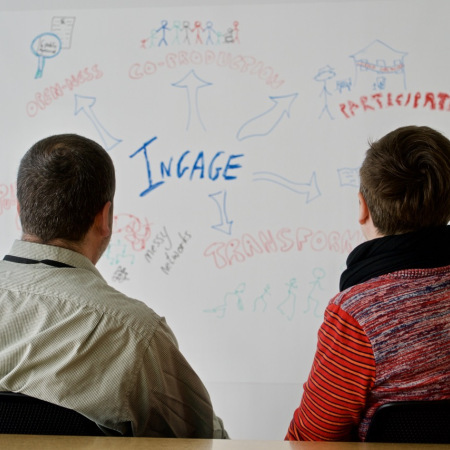 Our work is based on the core principles of collaboration, co-production and creativity, enabling people to participate in the decisions that affect their lives. We work in complex environments, and we know that we do not have all the answers to the systemic issues that we all face. Instead, we aim to work with colleagues, communities, civil society and public service organisations; learning, supporting and continually improving our responses to these ‘wicked’ issues together. Scottish Leaders Forum – a network of chief executive leaders from across Scottish public services, who work in partnership to develop and embed collaborative action, generating new ideas, processes and techniques, and to challenge existing ways of working, transforming public services in Scotland. Open Government Partnership – an international platform committed to working with civil society to make governments more open, accountable, and responsive to citizens. Scotland has been awarded ‘pioneer’ status, bringing with it opportunities to learn from and work with international experts and pioneer partners. Pioneering Collaborative Leadership – a unique offer of support for existing partnerships and teams who, though the course of their everyday work, are seeking to collaboratively deliver better outcomes. Fire Starter Festival – a week long festival of collaborative learning events, sharing creative, disruptive and innovative ways in which we can all transform ourselves, our organisations and the wider system. U.Lab Scotland – U.Lab is an online course, hosted by the Massachusetts Institute for Technology (MIT), designed to support transformational change. We are working with MIT to develop a Scottish context for the course, supporting people to innovate and change Scotland’ public services.